Personal Note: Now, I could have disregarded this and gone ahead with my original plan but I did not want to set him up for failure. I truly believe that it is important to work on skills and concepts where he is and build from there. When I began to focus on this is when I saw the most growth in him. This also reduces frustration on everyone’s part – his frustration is reduced because he is working on something he is ready for and has a chance to succeed at and my frustration is reduced because he is not resisting me due to his own frustration. I always remind myself that even though an activity we do may not seem to be the most challenging it could be, it can still be a challenge for him. Having gone the route of frustration many times resulting in miserable failure, I will choose building his knowledge, skills and confidence any day! Seems so basic and obvious yet the pressure to close the gap between a child with delays and their peers can often take over. If you can relate to this, take a deep breath and know that only by providing the foundation and starting where your child is in each developmental and academic area, can you help them progress and move forward. 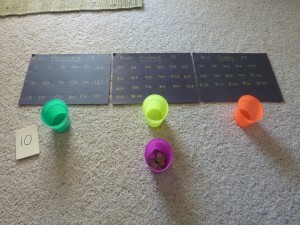 I decided that I was going to use my cup of coins (pennies, nickels and dimes – not ready for quarters yet) but was going to break down the activity and be very direct with what he was doing, what it looked like and what it meant. In my mind, this begins with the ability to sort the coins (which was yesterday’s post). They have to be able to recognize the difference between the coins first. I had some black construction paper out for another station activity but decided to use it for this instead. I used a gold marker I had gotten with my Christmas card pictures so he could see what I was writing. (The paper and marker color does not matter. I have done the same sort of thing with regular white printer paper and a black marker.) I labeled the pages, “Pennies – 1 cent/ $.01” and wrote out as many “penny” amounts as would fit in an organized way on my paper (see photo). 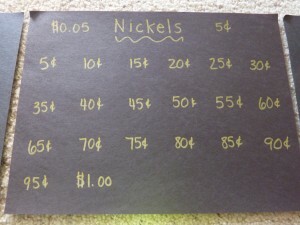 “Nickels – 5 cents/ $.05” and wrote out as many “nickel” amounts as would fit in an organized way on my paper (see photo). 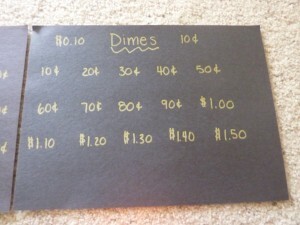 and “Dimes – 10 cents/ $.10” and wrote out as many “dime” amounts as would fit in an organized way on my paper (see photo). The key here is to remember that you are helping provide them with a foundation of coins and their value. 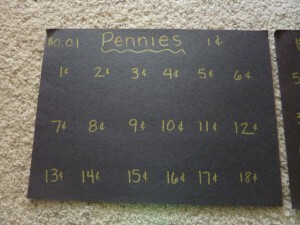 The coin charts help to give them structure (a place to put the coins) and information they may need when counting the coins. It is a tool to help build understanding. 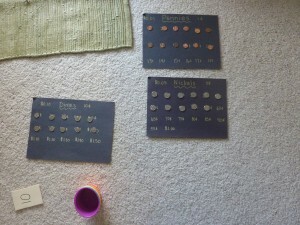 My original intention for this station activity was for him to sort the coins and then place them on the sheets. While we were doing this though, he began sorting them by placing them directly onto the sheets. Much more efficient! After the coins were sorted we counted all of the coins separately. If he got stuck, all he had to do was shift the coin a bit to see the amount written below. My Obstacle Course "Sort and Count" station completed. The next step will be to figure out the value of all of the coins but my intention for this particular station activity was to see where Andrew was with his skip counting, primarily 5’s and 10’s. When we begin to count the coins for their combined total value, I will use fewer coins to make sure he is understanding when and why we switch value amounts. I’ll show you some ways to go about this in the next coin counting post! We will continue this practice and will add quarters and paper money but for now I feel that he is really getting an opportunity to understand coins. Hearing how children really struggle with this concept makes me want to build this skill slowly and steadily. Turtle steps are worth it if it means gaining a real understanding of something, especially with a concept that tends to challenge children. **If you’d like to print them off of your computer, here are some charts I’ve made: Coin Counting Charts – clicking here will take you to another window, just click the words “Coin Counting Charts” and the PDF will open.